We all figured that Bungie would begin to take steps to fix Destiny's flawed loot system. Good news: The first big changes come next week. In a new update at the Destiny blog, the game's developers say that after next week's 1.0.2 patch, rare and legendary engrams will always decode to an item that's at least rare or legendary quality, respectively. 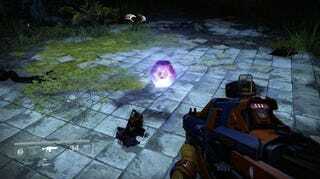 Meaning: No more decoding a legendary purple engram only to get a useless blue item. Hooray! In addition, weekly and daily heroic strike missions will add rare and legendary items to their existing rewards, meaning that there'll be more incentive to do those strikes and not, say, stand in front of a cave or something. The 1.0.2 patch will go live next week, and includes several changes to the Cryptarch and Engram experience. These changes guarantee that Engrams will always decode into items at or above the quality of an engram. Only Engrams that drop after 1.0.2 are subject to this change. It doesn't quite make up for the all the times the Cryptarch screwed us over, but it's nice to know that no one else will have to suffer in the future.